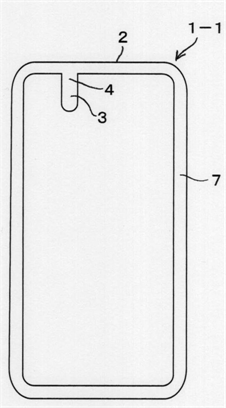 PROBLEM TO BE SOLVED: To provide a camera hiding device which is post-attached to a general purpose computer having the display window of a display and the light incident window of a camera arranged on the front surface and thereby hides the light incident window of the camera from a user who is facing the computer. 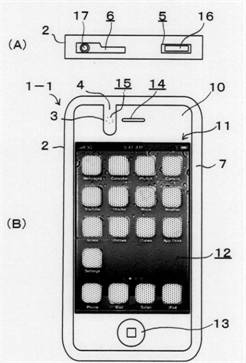 SOLUTION: A camera hiding device 1-1 comprises: a cover (a soft case) 2 for covering therewith the back surface and outer periphery of a smart phone 10; a shielding part 3 for shielding a light incident window 15 of the front camera of the smart phone 10; and a shielding body holding part 4 which holds the shielding part 3 such that the shielding part 3 can appear and disappear in front of the light incident window 15. 構造は至ってシンプル！　The structure is just simple! （前面周縁カバー部７にベロみたいな遮蔽部３がついているだけ。）There is just shelter part 3 which looks like a tongue in front limb cover part 7. 「こんなので特許とれるの？」Is the patent acquisition possible by such simple structure? 「安心してください。とれますよ。」Please be relieved! A patent can be acquired!